Report: Tamir Rice grand jury never voted on indictment. 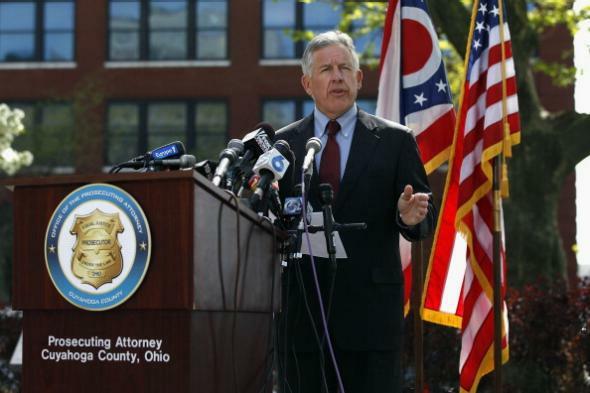 Cuyahoga County prosecutor Timothy J. McGinty at a press conference in Cleveland on May 9, 2013. The alt-weekly Cleveland Scene’s report revolves around the concept of the “no-bill,” which is the name for a grand jury’s formal decision—arrived at by voting—not to bring charges in a given case. (The opposite of a “no-bill” is a “true bill,” i.e. a decision to indict.) When Cuyahoga County prosecutor Timothy McGinty announced on Dec. 28 that officers Timothy Loehmann and Frank Garmback would not be charged in Rice’s death, he said only that the grand jury “declined to indict” the officers, leading many observers to assume that a no-bill had been voted on. But the Cleveland Scene’s reporters could find no documentation of such a decision, and a spokesman for the Cuyahoga prosecutor’s office responded to the publication’s queries by saying that there had been no vote. What any of this means for Rice’s case is unclear. A lawyer representing the Rice family said the lack of a no-bill could constitute another indication that McGinty—who formally recommended against indicting Loehmann and Garmback and presented expert reports to the grand jury that backed up his recommendation—had not taken the idea of prosecution seriously.